Sheridan, Amy (1838-1878): Made her début at the St. James’s Theatre in 1861. She moved to the Olympic where she appeared for five years. In comediettas and farces she was popular. Upon leaving the Olympic, Sheridan appeared fifty times at the Adelphi as Miss Sefton in Watt Phillips’ Maud’s Peril, based on a story by Charles de Bernard. That Christmas, she joined the company of Covent Garden, appearing in Gilbert à Becket’s burlesque Robin Hood. She subsequently appeared at Astley’s Amphitheatre where she gave "her beautiful and chaste impersonation of Lady Godiva" (The Standard, Wed, 6 March 1872). The portrait of this favourite actress, which to-day lends a grace to our pages, will be received with gratification by her numerous friends and admirers. If the artist as in any way failed to do justice to a face cast in Nature’s most charming mould, it must be attributed to the difficulty of the tusk rather than to any want of skill on his part. 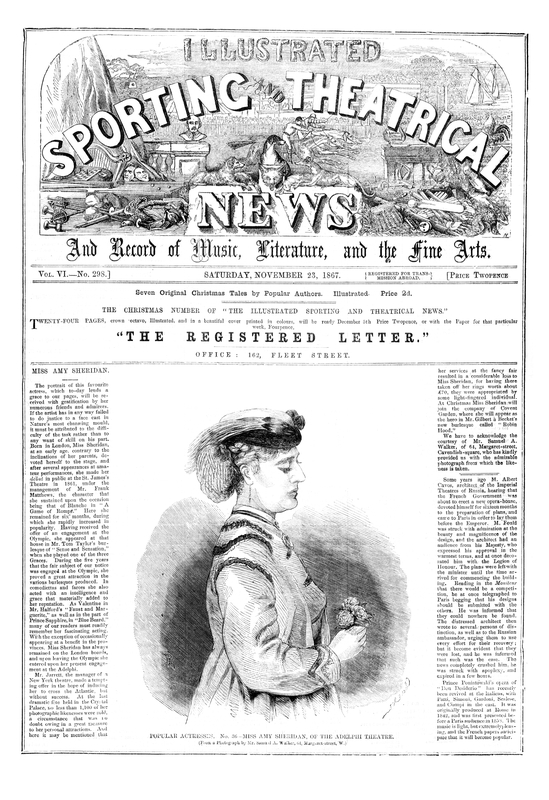 Born in London, Miss Sheridan, at an early age, contrary to the inclinations of her parents, devoted herself to the stage, and after several appearances at amateur performances, she made her début in public at the St. James’s Theatre in 1861, under the management of Mr. Frank Matthews, the character that she sustained upon the occasion being that of Blanche in "A Game of Romps." 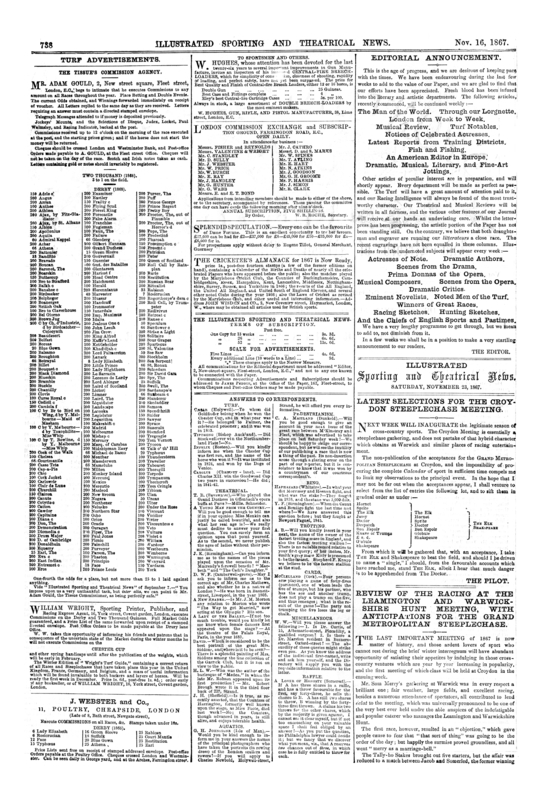 Here she remained for six’ months, during which she rapidly increased in popularity. Having received the offer of an engagement at the Olympic, she appeared at that house in Mr. Tom Taylor’s burlesque of "Sense and Sensation," when she played one of the three Graces. During the five years that the fair subject of our notice was engaged at the Olympic, she proved a great attraction in the various burlesques produced. In comediettas and farces she also acted with an intelligence and grace that materially added to her reputation. As Valentine in Mr. Halford’s "Faust and Marguerite," as well as in the part of Prince Sapphire, in "Blue Beard," many of our readers must readily remember her fascinating acting. With the exception of occasionally appearing at a benefit in the provinces. 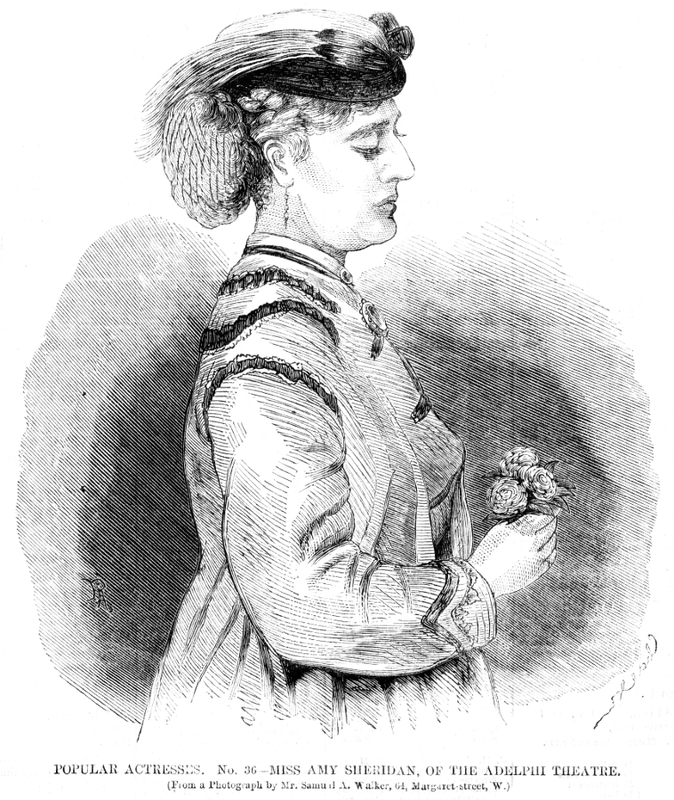 Miss Sheridan has always remained on the London boards, and upon leaving the Olympic site entered upon her present engagement at the Adelphi. Mr. Jarrett, the manager of a New York theatre, made a tempting offer in hope of inducing her to cross the Atlantic, but without success. At the last dramatic fête held in the Crystal Palace, no less than 1,100 of her photographic likenesses were sold, a circumstance that was no doubt owing in a great measure to her personal attractions. And here it may be mentioned that her services at the fancy fair resulted in a considerable loss to Miss Sheridan, for having there taken off her rings worth about £70, they were appropriated by some light-fingered individual. At Christmas Miss Sheridan will join the company of Covent Garden, where she will appear as the hero in Mr. Gilbert à Becket’s new burlesque called "Robin Hood." We have to acknowledge the courtesy of Mr. Samuel A. Walker, of 64, Margaret-street, Cavendish-square, who has kindly provided us with the admirable photograph from which the likeness is taken.